The Galactic Empire rules the stars with an iron fist, but when an ambitious captain of the Imperial Navy goes rogue in a bid for power, it could spell doom for the Rebel Alliance. 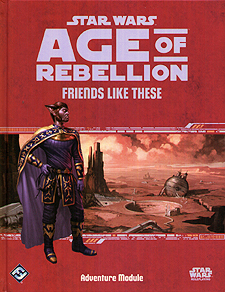 Caught in the crosshairs of the renegade captain, the people of Xorn need all the help they can get to hold out until the Rebel Fleet can come to their aid, but at what cost? The clock is ticking as a group of Rebel agents must rally what allies they can find to defend the innocent people of Xorn against an Imperial captain with a dark secret. Can they earn the respect of notorious Mandalorian mercenaries or will they sell their souls to acquire the vast armies of the Zygerrian Slave Empire? A desperate tale of warfare, diplomacy, and sacrifice perfect for seasoned characters. Species rules for Madalorian humans, giving players the opportunity to play the proud warriors of Mandalore. Mini-gazetteers for Xorn, Vlemoth Port, and Kowak, the home of the infamous monkey-lizard!